Welcome to language-easy.org! 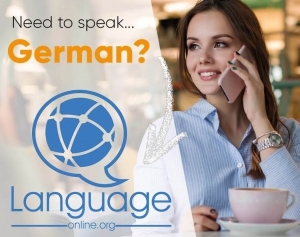 Well, as you have chosen this article, I suppose that you want to enter deeply in the world of German grammar and learn something about German passive voice. So, this part of the German language is, of course, of high importance. Nevertheless, the German passive voice is not used as frequently as in the English language. However, you should know master this grammar topic, as it is essential for understand news reports in newspapers and television. Furthermore, a lot of neutral reports in working contexts are written in the German passive voice. So, even though this part of German grammar might be difficult sometimes, but the its high importance should encourage you to study hard. Well, German is rather complicated language – There are a lot of exceptions which you can only master by studying hard. But think of the huge world of German culture and all the other possibilities that will open when you dominate this language. So, let’s not lose to much time and go straight forward to the first part of this article. Well, we will talk about what German passive voice actually is. After that, we will try to clear up how German passive voice is used in the correct kind of way. By the way, in case you want to know more about this German grammar topic, just have a look at this article on Wikipedia. First of all, we will have to clear up what the German passive voice actually is. So, there are two types of German passive voice which we will define in the following. First, there is the processual passive (Vorgangspassiv) which is conjugated with the verb “werden”. So, this type of German passive voice emphasizes an action. Well, let’s use and example phrase to show what that means. “Der Hund wurde angefahren” – The dog was run down. Here, you can clearly see the emphasis on the action. Second, we have the statal passive (Zustandspassiv) which is conjugated with the verb “sein” and emphasizes a condition. So, here is another example phrase that show the correct usage of the this type of German passive voice. “Der Hund is verletzt” – The dog is hurt. Obviously, the condition of the dog is described and not the action of hurting him. Of course, and absolutely typical for the passive voice, who or what caused the action or condition is either not important, unknown or assumed to be general knowledge. Well, as we have cleared up the two basic principles of German passive voice, we will now talk about it’s conjugation. 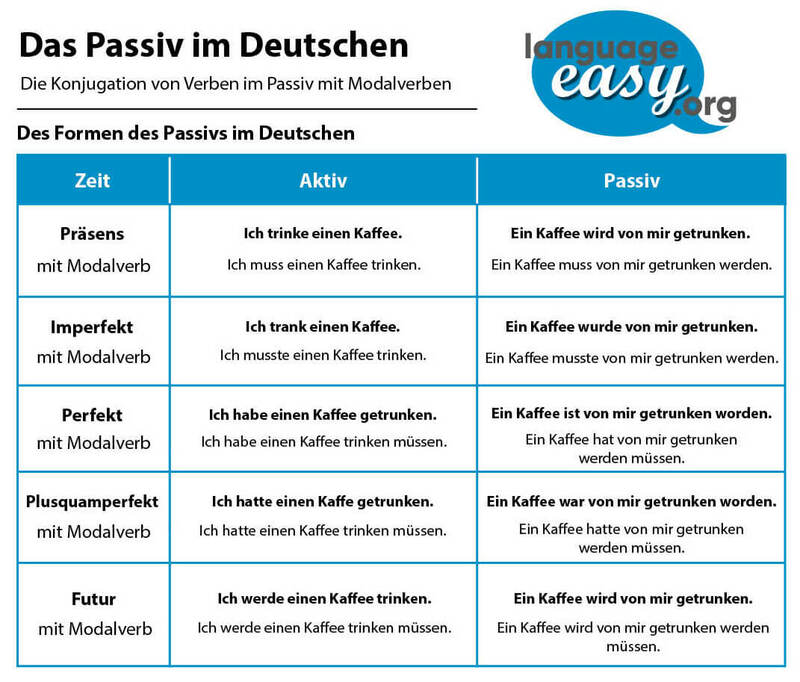 Now, we will come to the central part of this article about German passive voice. So, we will talk about the conjugation of both types of German passive voice and have a detailed look on their structure and some examples. So, not too difficult, isn’t it? And, to make it even easier to understand for you, let’s look at the following table with the conjugation of this kind of German passive voice in all German tenses. Present Der Hund wird verletzt. Present Perfect Der Hund ist verletzt worden. Simple Past Der Hund wurde verletzt. Past Perfect Der Hund war verletzt worden. Future 1 Der Hund wird verletzt verletzt werden. Future 2 Der Hund wird verletzt worden sein. Now, as we have cleared up how to form this type of German passive voice, let’s come to the next one and talk about it’s forms in different tenses. Second, we will have a look at the forming of the second type of German passive voice, the statal passive. Of, there is also a formula quite similar to the other type of German passive. Well, the only difference is that we need a form of “sein” and the past participle of the full verb. So, here is the rule. Now, we will illustrate what this formula means in the following table. Of course, we will have a look the conjugation in the 3rd person singular in all German tenses. Present Der Hund ist verletzt. Present Perfect Der Hund ist verletzt gewesen. Simple Past Der Hund war verletzt. Past Perfect Der Hund war verletzt gewesen. Future 1 Der Hund wird verletzt sein. Future 2 Der Hund wird verletzt gewesen sein. Now, we have reached the final point of this article. Well at this point we will have to clear up whether to use the active of German passive voice. Of course, all of you know that we use the active form to emphasize who or what is performing an action. Furthermore, the German passive voice is used to emphasize the action itself. Here, who or what is performing is often left in passive sentences. Unfortunately, we are learning German. And this means, that there are exceptions! Well, actually it’s not too complicated, so, don’t wory. Well, there are simply some kind of verbs that can’t be expressed in the German passive voice. In the following, we will have a closer look at these verb groups. So, this is the first group of verbs that can’t be expressed in the passive. Well, an example for this group of verbs would be “fahren” (to drive). Second, there are reflexive verbs which can not be expressed in the passive voice. Of course, all of you know that reflexive verbs always take a reflexive pronoun. Well, an example would be “sich beschweren” (to complain). By the way, just click on the link above for some more information about reflexive verbs. Unfortunately, there is another broad group of verbs, that can’t be expressed in German passive voice. Here, “schlafen” (to sleep) would be a good example. Others are “haben” (to have), “kennen” (to know), “es gibt” (there is). Das Haus wird von der Frau durchsucht. Die Frau durchsucht das Haus. Die Kinder wurden vom Mann geküsst. Der Mann küsste die Kinder. Der Ball ist von dem Elefanten gefangen worden. Der Elefant hat den Ball gefangen. Der Kuchen wird von der Mutter in den Ofen geschoben. Die Mutter schiebt den Kuchen in den Ofen.